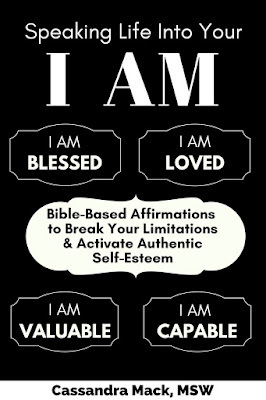 SPEAKING LIFE INTO YOUR I AM, is a book about tapping into the wisdom of Proverbs 18:21 by learning how to use your words to speak life into yourself and build healthy self-esteem. SPEAKING LIFE INTO YOUR I AM, is a book about affirming your worth and building the kind of self-esteem that emanates from within and that will carry you through the changing seasons of your life. It’s vital to the wellbeing of your soul and your spirit to break free of the notion that you need man's approval and acceptance in order to affirm your worth and speak life into your authentic identity as a child of God. In fact, relying on the approval of others for your self-worth, is a mental stronghold that robs you of your personal power. Here’s why: As human beings we were all made in the image and likeness of God. This alone gives every human being inherent worth and value, apart from anything that we could ever do, accomplish or achieve. But each of us has to come to this realization for ourselves so that we learn to speak life into our own lives. Regardless of what anyone has ever said to you or done to you or what you’ve been conditioned to believe; the deeper reality of your identity is this: YOU were created to reflect God’s glory, love, power, and light! You were created to SHOW UP for LIFE from your place of Power, Love and Resilience. Use this book to speak life into yourself and to positively affirm your identity as one who was created in the image and likeness of God. As you allow GOD to sit with you in prayer and recharge your spirit with His life-affirming Word, trust and believe that your life will be transformed. Let this book serve as reminder of how awesome You already are and what an awesome God you serve.